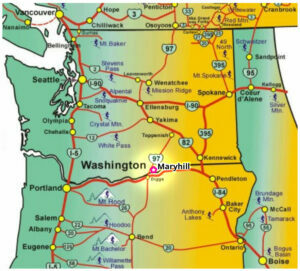 The closest airport to Maryhill is Portland International, about 1.5 hour drive from the hill. Seattle/Tacoma International is the next closest with a 4 hour drive to the hill. Head east on Interstate 84 to Biggs Junction and take exit 104. Make a left onto US Highway 97 and travel for 2.4 miles to the top of the hill. At the stop sign, take a right, go 1.2 miles, then turn left onto the Historic Maryhill Loops Road. Head east on Interstate 90 to exit 110, just past Ellensburg, and take Interstate 82 south towards Yakima. Travel on I-82 for about 45 minutes to exit 50 (Toppinish/Buena) and take a right onto Highway 22. Follow Highway 22, be sure follow the speed limits, through Toppinish before it joins US Highway 97. Take US-97 south to Goldendale. About 10 miles south of Goldendale, at the junction of US-97 and Highway 14, take a left onto Highway 14 for 2 miles before taking a left onto the Historic Maryhill Loops Road. Remember, see windmills, go fast! Head west on Interstate 90 towards Ritzville and take exit 220, Highway 395 south to Tri Cities/Pasco. Follow Highway 395 about 90 minutes through the Tri Cities to Interstate 82 (there are no services once you leave the Tri-Cities so be sure you’re stocked). Head south on I-82 to Exit 131, just before the Oregon border, and head west on Highway 14. After about 90 miles, take a right onto the Historic Maryhill Loops Road. Heading west on Interstate 84 towards Biggs Junction, Oregon, take exit 104 and make a right onto US Highway 97. Follow US-97 across the Columbia River to to the top of the hill. At the stop sign, take a right, go 1.2 miles, then turn left onto the Historic Maryhill Loops Road. Head north on Highway 97 to Biggs Junction. Once you cross the Columbia River into Washington, stay on US-97 to the stop sign at top of the hill. Take a right at the stop sign and proceed about 1.2 miles before turning left onto the Historic Maryhill Loops Road.